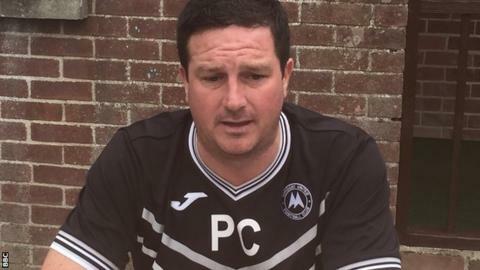 Paul Cox has said he resigned as Torquay manager because he was told he would not be paid by the club. Cox, 43, left Plainmoor last week after only three months in the job, before director of football Dean Edwards resigned three days later. In a statement, Cox said he understood when he was appointed that he would initially be unpaid. But he added: "Over the following weeks, certain aspects that were agreed were not adhered to." 2004: Promoted to League One. 2005: Relegated back to League Two. 2007: Finish bottom of League Two and relegated to the Conference for the first time in the club's history. New board takes over, including lottery winner Paul Bristow 2008: Lose in Conference play-off semi-final to rivals Exeter City. 2009: Return to Football League after winning Conference play-off final. 2010: Paul Bristow dies. Wife Thea takes his place on the board. 2011: Lose League Two play-off final to Stevenage. 2012: Finish fifth in League Two, losing to Cheltenham Town in play-off semi-finals. 2015: Torquay finish 13th in the Conference with Thea Bristow leaving the club and a new board taking over with a vastly-reduced budget. Cox was installed in June after former boss Chris Hargreaves was placed on gardening leave, having refused to take a pay cut following a takeover. "I felt that I was well within my rights to call a meeting and ask for some transparency from the board as to my financial future," Cox added in his statement. "It was made clear to me that the club would not be in a position to pay me any salary of any kind in the near future, possibly not even this season. "Having family back home in Nottingham to support, it was with a heavy heart that I then had to make the decision to resign." Ex-Mansfield manager Cox says he then agreed to discuss a potential deal but that "following further talks it was clear that club was in no position to make any offer of any kind." Meanwhile, the Gulls, who are 18th in the National League, have have re-signed Durrell Berry. The 23-year-old full-back made 12 appearances for them before joining Cheltenham, who released him this summer. And defender Harry Hickford, 20, has joined on a month's loan from MK Dons.